Supercritical fluids and their liquefied analogues have been traditionally used in single unit operations, i.e. extraction, fractionation, using neat supercritical carbon dioxide (SCCO2) or with appropriate modifiers. Many of the supercritical fluid extraction processes have been devoted to extraction of food and natural products. Beginning in the mid-1980s, columnar and chromatographic techniques followed by reactions in supercritical fluids were developed to facilitate supercritical fluid derived extracts or products, thereby extending the application of a critical fluids processing platform beyond SFE. These newer developments were investigated in part due to the complexity of many natural product matrices and the desire to concentrate specific target components for food and other industrial uses. 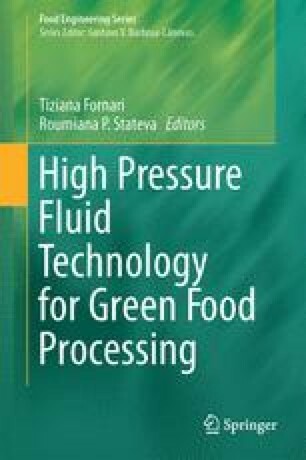 In this chapter the advantages of coupling processing options using critical fluids are discussed and pertinent examples provided. Hence by combining different unit processes and sequencing them with the use of multiple fluids utilized at different temperatures and pressures, one can obtain multiple products and optimize the extraction or reaction process. Several specific options are illustrated for the cases of processing lipid-based materials such as concentrates of tocopherols, sterols, and phospholipids. Sequential isolation of both non-polar and polar ingredients is documented using a combination of fluids and/or unit processes. Finally the merits and difficulties in integrating critical fluid technology into the concept of a “bio-refinery” are provided.